Summer has started off hot and dry, but it’s not too hot to landscape. When we get into the dog days of summer, we shift our landscape installation focus from plantings and working with nursery stock to construction projects. There’s been an increasing request in the area for “Outdoor Living Areas.” These can range from complex outdoor kitchens equipped with sinks, grills, refrigerators, lighting and seating areas or something simple like an extension of an existing patio. 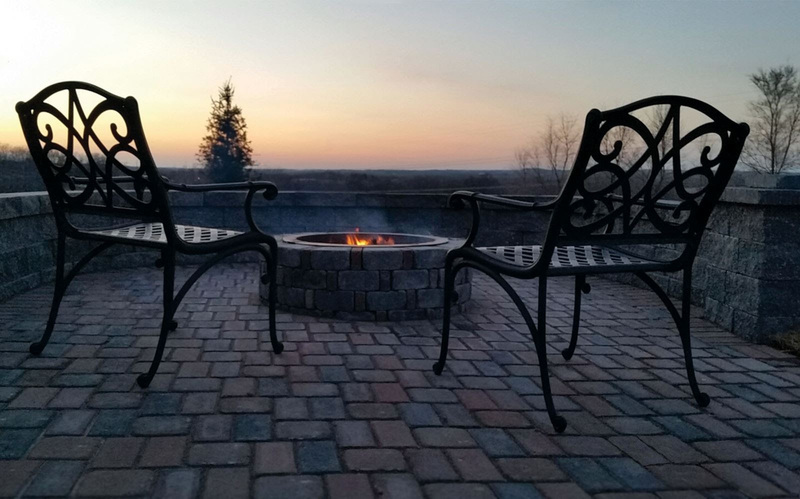 Very seldom do we come across a property that doesn’t have some sort of fire feature, be it a metal contraption on their front drive or a custom stone fire pit on the backside of the home. These outdoor living areas are places to make memories, tell stories, and kick back and enjoy life with friends, families and neighbors. -General landscape cleanup… Have your shrubs grown a bit and just need shaped or pruned, not to mention there are some weeds to pull. -Mulch topdressing… Maybe you planned to do it this spring, but didn’t get around to it and now it’s too hot? -Redefining landscape bed edges… Does your mulch or rock kind of blend into the turf? Do you need edging put in to separate these regions? -Do you have areas of the lawn that aren’t draining properly following a heavy rain? Downspout extensions or addressing settled areas can make the world of difference in keeping your lawn or basement dry.